Check back frequently to see the lastest Wine Art that Melanie Haislip has created. 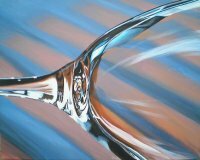 See original wine art and meet the artist at upcoming shows. Custom Wine Cellar & Bar Art Painted Just for You! 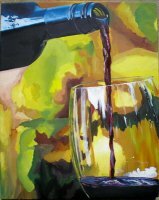 If you are interested in having a unique wine or bar art painting created, contact us today. You can visit our site, www.melaniehaislip.com for more information on wine art on canvas. 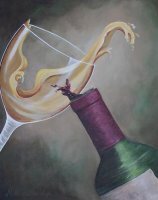 We will offer several original Wine Art examples created just for you to choose from. 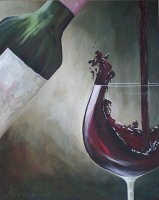 "White Splash" - Wine Art Print is Fabulous and the perfect companion to "Red Splash". The Movement of the Wine Splashing out of the Glass will bring Excitement to Your Dining Experience! Muted green, brown and off white background. 24x30" Wrapped Canvas on Stretcher Frame is ready to hang! "Patio Lights" - Wine Art Print is Beautiful capturing vivid light reflections on the glass and wine. You will find yourself staring at this print forever! 22x26" Wrapped Canvas on Stretcher Frame is Ready to Hang. "Wintergreen" - Wine Art Print is Stunning. 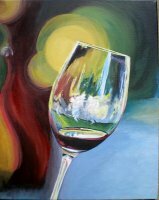 The Bright colors Jump Off the Canvas with Reflections of light Bouncing off the Wine and Glass! 22x26" Wrapped Canvas on Stretcher Frame is Ready to Hang! "Waterfront" - Wine Art Print has become one of the top sellers. The bright sunset sparkles through the bottle of wine and pair of wine glasses. The periwinkle blue water has yellow reflections dancing atop. Available in various sizes. 22x26" Giclee Print is on Wrapped Canvas and Ready to Hang! "Tigress" - Wine Art Print is INCREDIBLE! It captures a Pinkish Orange Sunset and Blue Shadows of Porch Rails, which will Keep You Gazing. Details of Brown and Black Swirling are Reminiscent of the Tiger's Eye. 16x20" Wrapped Canvas on Stretcher Frame is Ready to Hang.